This guide details the Magome-Tsumago trail route. It is easy trail and it is well sign posted. Magome-Tsumago sign posting is available in English and Japanese. You can also use this article to walk from Tsumago – Magome. Japan is a great place to hike, fellow hikers are friendly, accommodating and helpful – we hope you enjoy! The Magome Tsumago Trail is the most famous of the Kiso Valley hikes and takes in both of the ancient post towns. The Magome – Tsumago hike is mentioned in most of the guidebooks as one of THE things to do for travellers to Japan. It’s also referenced as the most popular part of the Nakasendo Hiking Trail. A Magome Tsumago day trip is easy from Nagoya especially if you have a JR Pass for the trains. (Buy your JR Pass BEFORE you get into the country and save a fortune!) The Magome to Tsumago trail is about 8 kilometres (5 miles) long and has only gentle elevation changes. We hike and travel in standard Merrell hiking shoes but you could do this in sports sandals if you wished. What Distance is the Magome – Tsumago Trail? How long does it take to walk from Magome to Tsumago? Get a full PDF copy of this article and all our maps – drop your email address in the sign-up form and download immediately. There are a variety of routes to Magome – from Tokyo, from Kyoto, from Nagoya. Here are the primary routes to get to the Kiso Valley. You can either take the train from Nagoya to Nakatsugawa and then take the bus to Magome or you can take a bus. The bus from Nagoya to Magome leaves from the Meitetsu Bus Centre ever hour and stop at the Chuodo Magome stop, from there it’s a 1.5 kilometre walk to the centre of Magome. Take any Japan Rail train to Nakatsugawa. These trains are covered on the JR Pass, which saved us a fortune in travel fares during our month in Japan. You can buy a pass for 7, 14 or 21 days of unlimited travel, but you MUST buy it from outside the country. Buy one NOW and get it mailed to your home/current address. Once in Nakatsugawa and make your way to Magome – here are the details of how to get to Magome from Nakatsugawa. The stop is right outside the Nakatsugawa train station, which is also where the friendly (and English speaking) tourist information office is. The bus from Nakatsugawa to Magome costs 560 Yen and takes around 35 minutes. Once you’re in Magome, it’s a 300 metre hike uphill to the tourist information office. It’s obvious and signposted. It’s a cute little pedestrian only walk way, past stores and cafe’s and renovated houses. Almost a little twee. If you’re looking for peace and quiet before or after your hike, then Magome or Tsumago is your place. From the Nakatsugawa train station, you can actually start walking from Nakatsugawa station to Magome and then onto Tsumago, but we chose to take the local bus from Nakatsugawa to Magome. The Nakatsugawa Magome bus takes about 35 minutes and runs at different times during the week and weekends. During the week you can get a bus at 07:42, 09:10, 09:40, 10:15, 11:15, 12:12, 13:12, 14:12, 15:12, 16:12, 17:12 and 18:30. At the weekend buses go from Nakatsugawa to Magome at 08:10, 09:10, 09:40, 10:15, 11:15, 12:12, 13:12, 14:12, 15:12, 16:12 and the last bus is at 17:45. It costs 560 yen per person. It’s easiest and quickest to take a bus from Shinjuku Bus Terminal to Magome. You can take the three-times daily Chuo Liner Kani at 0720, 1040 and 1650. It takes 5 hours to get to Magome from Tokyo and stops at the Chuodo Magome stop, which is 1.5 kilometres into the town. Take a train from Kyoto to Nakatsugawa and from there take the bus to Magome. The train to Nakatsugawa from Kyoto takes around 90 minutes on a regular train that’s covered on the JR Pass. Faster Shinkansen trains will get you from Kyoto to Nakatsugawa in 30-45 minutes, but are not covered on the JR Pass. If you take an early train to Nakatsugawa, then the bus to Magome, you can hike the Magome-Tsumago trail in a day from Kyoto. When you finish the hike in Tsumago, simply follow the directions later in this article to return from Tsumago to Nagiso JR Station and from there to Kyoto. To use the train to get to Tsumago, the closes station is Nagiso station. You will likely need to get a stopping service from Nagoya, however many trains do not stop at Nagiso. A Tokyo to Nagiso train takes around 3 hours. If that’s the case then transfer to Nakatsugawa Station. From here you will need to take the bus from Nakatsugawa to Tsumago. If you have got off the train at Nagiso you will need to take a taxi or bus to Tsumago. There are tourism offices in the towns on the route of the Nakasendo trail. They are easy to find, the staff are superbly helpful and will provide you with maps and assistance for hiking. The Nakatsugawa tourist information office is at the train station, (to the left as you come out), and they hand out hiking maps and information. It is handily close to the bus stop, which you just can’t miss right in front of both the station and the tourist info. The Magome tourist information centre is where you drop your bags if you want them transported to Tsumago, which we did. You’ll find the Magome tourist information office a few hundred metres up the hill (it’s on the way to the walk signposted, so no back tracking required). They’re friendly and speak great English. The tourist centre in Tsumago will provide you with onward bus times and it’s where you’ll be able to collect your bags from the luggage transfer service. This office is in the centre of Tsumago and is easy to find. Walk uphill from the bus stop and drop your bags at the tourist information office. As you cross the road at the top of the hill, there’s a fabulous viewpoint. There are signposts along the way. Then you head off downhill again, skirting through a small wood to cross the road again. Crossing the road is a feature of this walk. At the entrance to the wood is a static bear bell. Give it a good yank and scare them off. We didn’t see any bears, but you’ll find bells by each wooded area. For a lot of the route – it’s only 7.7 km long – you’ll skirt around and close to the road. It’s a very quiet road, so it won’t bother you. The trail starts in Magome at an altitude of 600 metres, rises up to 801 metres and then descends to 420 metres in Tsumago. There are woods to go through but few views until you start the final descent towards Tsumago. Once you leave Magome there is nowhere to buy water for the trail, so either buy water in Magome or take your own filter water bottle. There are streams along the way. Check out our guide to buying the best filter water bottles – these allow us to drink river, stream and untreated tap water. Before that though be sure to stop at the Teahouse that you’ll find perhaps two thirds of the way to Tsumago. The tea is free, and the kind gentleman here will also offer you fruits and candies. He’ll ask you to sign his guest book and you can marvel at the range of nationalities that you’ll find in it. Be sure to leave pop a few yen into the box on the table by the entrance so that he can replenish his supplies. We saw perhaps 10 people the day in mid-October that we walked this trail. It was a glorious autumn day, but they leaves hadn’t started to turn at all. It’s a pleasant walk, but won’t tax you much at all, but it’s a pleasant way to spend a couple of hours. The best time to hike from Magome to Tsumago is between April and November. If you are planning to hike from Magome to Tsumago and then move onto your next destination, then the luggage forwarding service available from the Magome Tourist Information to Tsumago Tourist Information is only available from April to November. This would also be the best time to walk the Nakasendo trail in its entirety. Which is the Best Direction to Hike Magome-Tsumago-Magome? There’s debate about which way round to do this walk – it’s hard to call it a hike because it neither took very long nor was it particularly difficult. Having walked from Magome – Tsumago I’d say that’s the way to do it and here’s why. If you have luggage that you wish to transfer then the transfer service operates in the direction of Magome to Tsumago only. For us, the transport to get to and from Magome-Tsumago and Nagano is better suited to hike it this way. What is the Altitude – Magome – Tsumago Trail? Magome’s altitude is 600 metres. The trail from Magome to Tsumago rises to a pass at 801 metres and then descends to 420 metres in Tsumago. The trail between Magome and Tsumago is 5 miles (8 kilometres). The route from Magome to Tsumago takes 2-3 hours. But you shouldn’t rush through this route. You’ll want to take the time to explore the teahouse en-route, and enjoy the country of the Kiso Valley. You will want to take some time to explore the villages of Magome and Tsumago. Visit the Magome tourist office to find the latest things to do in Magome. The tourist office in Magome also has lists of places to stay in Magome (although we recommend pre-booking your room prior to arrival) and the bus timetables to leave Magome. the Nakasendo Trail, but also as it is the birthplace of Shimazaki Toson, a key figure in Japanese literature, one of his most famous novels is Yoakemae (Before the Dawn). Housed in the old official inn of Magome, Toson’s father was the last overseer of the Magome honjin and Toson was born here. The honjin is now a memorial to the writer. The museum is open from 0900 – 1700 and admission is 550 yen. Serving the lower class travellers, this is a reconstruction of the original building and the displays inside reflect Magome’s history as a post town. Admission is 300 yen and the museum is open from 0900 – 1700. This museum also focuses on Toson and his life during the Meiji period. It costs 200 yen and is open from 0900 – 1700, although winter hours are irregular. There are some fabulously rated places to stay here, from dorm beds to the full ryokan experience. If you do decide to stay in a ryokan here, be sure to check out our guide to ryokans and etiquette. Once all us day trippers disappear you’ll have the place to yourself. You’ll need to book ahead though to ensure your bed and board. We recommend the following three places to stay in Magome. Stay over and experience cultural Japan before you head out on the Magome – Tsumago day hike! Japanese style breakfast and dinner included. Simple traditional rooms with futon bedding and a tatami-mat floor can be found at the Magome Chaya Hotel. Rooms have shoji paper screens and low table > Check availability and prices here. Meals available if reserved in advance at an extra cost. Guest House Gaku Magome is just 7 minutes’ walk from Magome and is the budget option in Magome. Dorm beds here are the cheapest place to stay in town. > Find a bed and book it now! All rooms have views of Mount Ena. Or search for other properties in the area. The nearest large town is Nakatsugawa, which is just 35 minutes away by bus. Visit the Tsumago tourist office to find the latest things to do in Tsumago. You’ll find cafes and small stores to purchase souvenirs here in Tsumago. The tourist office in Tsumago also has lists of places to stay in Tsumago and the bus timetables to leave Tsumago. Buy a combo ticket for 700 yen and also visit the Wakihonjin and the Rekishi Shiryokan too. Open 0900 – 1700 (closed Dec 29-Jan 1). In olden times the Honjin was the main inn in town and served government officials. The Tsumago Honjin was reconstructed in the 1990’s, but it is faithful to how it was in the 1830’s. Tsumago’s Honjin was reconstructed in the 1990s, but great efforts have been taken so that it resembles its condition in the 1830s, when it served as an inn. Open from 0900 -1700 and costing 600 yen unless you buy the combo ticket for 700 yen, this building is genuine and dates to the 19th century. A Wakihonjin was an inn that was built to serve lower class travellers. The Wakihonjin in Tsumago is now a museum. Tours are only in Japanese. A 600 yen admission fee will get you into this extensive museum on the Kiso Valley and Tsumago. There are many English translations here. Buy the combo ticket and save hundreds of yen. Opening hours are 0900 – 1700. Admission is by donation, which is optional/ this Buddhist temple is thought to have been built in 1500. Although the castle here was demolished hundreds of years ago, it’s still worth the trip for the views of the town. It’s located a kilometre north of the main street. Get maps from the tourist information office. Try the local buns filled with bean paste or vegetables (oyaki). Favourite local foods include chestnut laced sweets and soba noodles. There are many places to stay in Tsumago, if you can’t find somewhere that you want to stay in Tsumago, simple head onto the next big town, which from Tsumago is Nagiso. I’ll start this section by saying that you do not need Japan hiking maps to hike from Magome –Tsumago. The route is well sign posted. If you plan to hike the full Nakasendo Way, then I’d recommend buying a map of the Nakasendo Trail. We have included a basic Nakasendo Way Map in this article. Here’s the Tsumago to Magome trail map. This comes courtesy Nagiso Tourism. It is an element of the larger Kiso Valley Map and the full Nakasendo Trail Map. There are other hikes that form part of the Kiso Valley trail, but the most popular part of the Kiso Valley walk is the 8 kilometre / 5 mile walk from Magome to Tsumago. Kiso Valley hiking is similar to that of the entire Nakasendo Trail and is easy hiking. For 500 yen, if you get your bags to them by 11:30am, the Magome Tourist office will deliver them to the Tsumago tourist information office by 1pm. And then you’re free to set off. The walk isn’t that strenuous, so if you’re carrying light packs, then strap them on and get going! They will also give you directions to the tourist office in Tsumago (although it’s very easy to find). The Tourist office provides the bag transfer service SEVEN days a week from March 20th until November 30th. If you wish to contact them to confirm this, here are their details. You’re also able to rent bear bells at the tourist info office in Magome. We didn’t, figuring that the whistle on my daypack would suffice and we were fine. The Kiso Valley hikes that the Magome- Tsumago trail is part of is a small part of the much longer Nakasendo Trail, one of Japan’s most famous hikes. The Nakasendo Walking Trail is the historic route between Kyoto and Tokyo. Towns along the Nakasendo trail are ancient post towns, where those collecting taxes for the emperors used to stop enroute in the Edo Period, (1603-1868). The entire route from Tokyo to Kyoto is 534 kilometres and is dotted with small town’s enroute where you can stay in between easy days of hiking. There were 69 of these stations along the route. These post towns, or Juku, were where the travellers rested at traditional small family guesthouses, or Minshuku. The Nakasendo Trail is also sometimes known as the Kisokaido and the most popular part of the route winds its way through the Kiso Valley. Walking the Nakasendo trail on your own is entirely possible, although this entire route will take 12 days and you may wish to organize through guides, which you can do here. Hiking through the Kiso valley for 3-5 days is the most popular way to see this ancient route. The Nakasendo Way is primarily a flat, easy hiking trail. Most people will hike the Nakasendo as a self-guided trail, as sign posting is simple, although primarily signage is in Japanese, apart from the most popular part of the route, Magome – Tsumago. Hiking the entire Nakasendo Trail and want support along the way? Check out prices and details here. There were plenty of domestic tourists in Magome and Tsumago, bussed into the pretty villages at either end of the trail, but not so many walking on the Magome to Tsumago trail. Not many people at all walking between the two. In fact, we met one group of domestic tourists and three small groups of foreigners. That’s all. We hiked between Magome and Tsumago in October. We were staying in Nagoya the night before our hike, at the great Eco Hotel (we found it to be good value, great location), < check out prices here – so we took the train from Nagoya to Nakatsugawa. We were also moving on from the area afterwards, so took our bags with us and took advantage of the bag transfer service from the Magome tourist office (details below). Leaving the Kiso Valley after your hike is easy, whichever direction you choose to hike the Tsumago Magome trail. Collect your bags from the tourist information office, pick up the bus and train timetable and get directions for your onward journey. There are buses (latest timetables at the Tourist Office in Tsumago) to Nagiso or Magome. You can also walk from Tsumago to Nagiso in around 45 minutes. You can take a bus from Tsumago to Magome. Buses leave from Nagiso station to Tsumago to Magome at 0840, 1005 1240, 1415 and 1635. The cost is 600 yen. The bus from Tsumago to Magome takes about 30 minutes. The buses from Tsumago to Nagiso station (the nearest train station) don’t go very often and cost 300 yen each. Or you can take a taxi for about 1000 yen. The bus takes about 10-15 minutes to get from Tsumago to Nagiso station. The latest times are posted in the Tsumago tourist information centre. From Nagiso JR Station you can reach other areas in Japan. You can take a local train back to Nakatsugawa and then get an express back to Nagoya if you’re doing this as a day trip. Again this is all covered on the JR Pass – so make sure you get one! That’s it! That’s all you need to know about planning a trip to Magome and Tsumago. We left Tsumago, took the bus to Nagiso, where our train took us to Matsumoto, where we were bedding down for the night at the next to the train station ACE Inn – it’s a great place to base yourself and good value. Get the latest prices here. Don’t forget if you have any questions you can email us [email protected] or drop us a comment below. Great trip report & many nice pictures! Thanks for sharing with us. Quite a lot of useful info, indeed. In November I plan to walk Nakasendo Trail with my girlfriend and our only concern is whether it’ll be possible to drop our luggages in Magome’s Tourist Office upon arrival MIDWEEK. Japan Guide.com states that the service is available daily until the end of November, however I found a contradictive information on LP’s website. They say daily service is only available in the summer (Jul-Aug) and for the rest of the time luggage drop is supposedy possible only on weekends and National Holidays. Do you know if that’s the case by any chance? If so is there any alternative to transport our bags between two villages? Would taxi drivers accept to take the luggage on it’s own and deliver to the chosen Ryokan in Tsumago? I’m simply asking as we know for sure we won’t arrive during weekend and so far no one was able to confirm the details. Hope you can help with your experience on the matter – that would surely help us a lot to plan the trip accordingly. Once again, thank you for your help, Sarah. My family and I plan to visit Magome – Tsumago for a day trip in November. We have children and old people that cannot walk much so we plan to take a bus from Nakatsugawa to Magome, take bus again from Magome to Tsumago then to Nagiso. Is it possible to do so? Without doing the walking, do we miss alot? Going back to Nagoya, can we take JR Shinano Ltd Exp train from Nagiso back to Nagoya?. just found your website! So informative! Thank you for sharing all your tips. Most amazing place for visit to make holiday memorable.Thanks for your blog. We are trying to do Magame-Tsumago hike and Shirakawago trip together, in whichever direction. What would be the best itinerary using public transportation? Thanks! Lots of good information on your website! Thanks! I think the best way would be to get a bus from Magome to Nagoya (and you can do the walk in either direction and get a bus from Tsumago back to Magome if you do it that way) then from Magome to Meitetsu Nagoya and then from there to Shirakawago. It’s about 7 hours in total. Of all the reviews I read, this is the most detailed. Thank you very much! I’m surprised that it took me so long to get to this site. It serves to be way up there on the search results. My wife & I are arriving Nagoya on Nov 5 @ 2100HR. Is there a way for us to go straight to Nakatsugawa for the night? Could we have the pdf of this fantastic article. We’re planning do do this walk on 10 April and maybe there will be some cherry blossom along the trail. Thanks so much. Thanks for the wonderful article. I’m hoping to do this walk in April 2020 but the only thing bothering me is the sightings of bears in the area. Have there been attacks on people in recent years or do the bears move away when they sense people are nearby? Do the noise that the bells make actually work in warning the bears off? Hi There, thanks for your kind comments. I too was concerned about the bears, but there’s no evidence of them on the trail. The Japanese are very conservative and if there were ANY issues at all they would do something about it. I suspect the bear bells and the possibilty to rent them are more for tourism and revenues than anything else. I check and update this article every 3 months or so and haven’t seen any evidence , apart from one sighting in September 2016. If you have any concerns when arriving, I would ask at the tourism office in Magome, they speak English and will be able to help. The trail is relatively wide and when you hike through the woods they are also open and you can see quite a distance. Wow Sarah, this is a fabulous article. I have a 12 year old child, what do you think would be the best for us to do? I am not sure if he would be up to the hike although we have done some around Oahu, the Makapuu Lighthouse Trail he totally loved, although this is only around 2.5kms. Pokemon had a big helping hand in his hike to the top. What are the best child friendly places to stay as well? Hi Amanda, thanks so much for your kind comments. I think he’d love the tea house that you get to see part way along – the old man there is so kind – and it would be a great cultural experience – plus I imagine, renting bear bells and ringing the big bear bells along the route would be fun too. (heck it was for me!!). The walking isn’t too difficult, and you could always walk to the tea house and turn around and head back to Magome. There are maps you can get from the tourist office which point other items of interest along the route. I think a ryokan ( there are several in Magome, mentioned in the article) would be an uber cool place to stay for an experience – I mean sleeping on mats on the floor is kinda cool right? Wearing traditional clothes is also fun too! Love the website- great info. Main problem I’ve run into is the lack of baggage transfer services over Winter -any suggestions? Hallo there and thanks for the comment. I’d suggest contacting both the ryokan / hotel you’re staying in at both ends of the walk and asking for their help, they will likely have a service that they can offer. 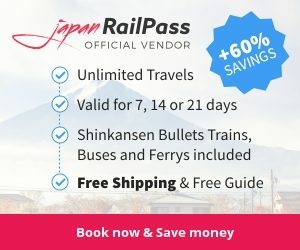 At the same time I’d suggest asking the tourism office in Matsumoto (https://tic.jnto.go.jp/detail.php?id=1142) and also Magome tourist office , that you’ll find on the same link as they list out the tourism offices and contact details. They also will likely offer a service, or be able to recommend a solution.